Today, I wiped it out, added all 1500CP and above back in. I look at Genie and My Pokemon are all listed, I try to use the Battle Sim and says I need to import Pokemon into my list…? On android… did a force stop, deleted cache, restarted, same issue. Force stop, delete cache, delete app files, uninstall, restart, reinstall, re-scanned a few Pokemon to the list, verified they are there and I can open each one for more details, go to Battle Sim and same issue. Emailed them for support… auto reply saying extended wait time and may not get a reply so, figured I’d see if anyone here has any ideas. I think he is fixing the build in Pokédex. It has lots of incorrect data. That is a ton of work. But I see regular updates, so he might also be fixing the reported issues. Give a day or two and there might be a an update. And the issue it self I don’t know about, because I don’t use the battle simulator that much. Actually got a reply already… usually when you get the ‘high email volume’ auto-reply that means, don’t expect a reply. Basically Pokemon Go changed the layout of the screen just enough that the stardust/movesets don’t detect. Gotta basically scroll down to where they show, then run the scan which means the CP is cut off so you gotta enter that manually. Then the image of your Pokemon in Poke Genie is cut off at the feet. So your Poke list will be mainly white boxes with a small strip of what your Pokemon’s feet look like. I’m not very good at the game and absolutely horrible remembering names and what counters what so for raids I kinda need the Battle Sim, but honestly, doesn’t seem worth the effort until fixed. Just wiped out 150 Pokemon and rescanned 100 back in this morning and all I use Poke Genie for is for IV and the Battle Sim. In my opinion, it is much better than genie. 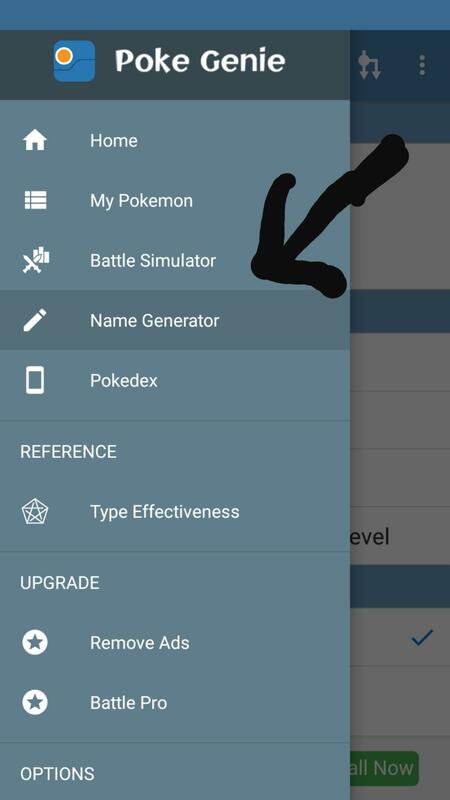 The battle simulator is able to show up to 15 unique pokemon. It has some features that pokegenie doesn’t have, but the styling of PokeGenie is beter in my opinion. The only good use for Calcy IV in my opinion is gym status. I’d Pokegenie get’s that, Calcy IV is gone. I barely use it, but Poke Genie works fine for me. Well, the creators of it replied back saying scan, shift the screen up and scan again… which sorta worked. Few got doubled, few didn’t work. Annoyingly when I clicked to do a battle sim, it crashed. So. Force stop, clear data/cache, uninstalled, rebooted phone, installed app again, added 3 or 4 and it worked. Added in another 40 and now crashing again. Last time I had this issue, the only fix was to reset the entire phone and start over again. Not gonna happen. Great for IV calculator, but otherwise, it’s become useless for me. If working without issue for some people, I suspect it’s working using old data. 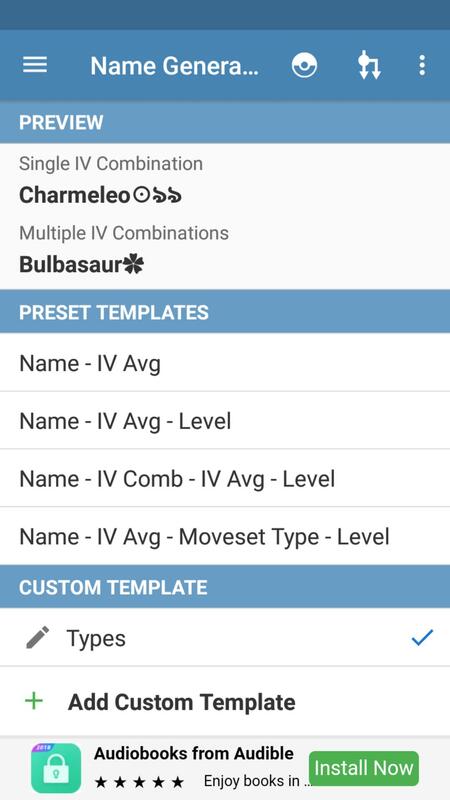 Clear your Pokemon and re-add and it’ll probably have the same issue. That you you have one of those really wide screen ratio phones and it’s able to screen grab all the data still. I’d like to start using the name-generator feature. 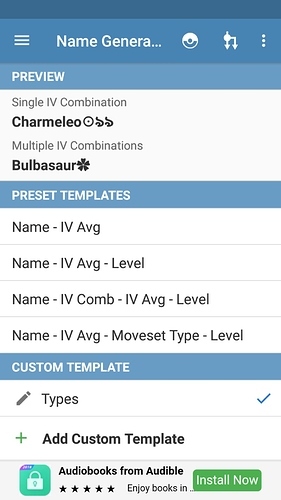 Where can I find something that shows what each of the moveset type symbols means? Thanks; I found those already from the general instructions. That’s where the template-choice can be made. But it doesn’t show what each of the various different squiggly symbols in the moveset type field represents. Or maybe it does but I’m not seeing it. I refuse to believe that they could have gone to such lengths to produce the feature without posting somewhere a key to interpreting it. This is the biggest temptation I’ve had in years to give up my swearing-off of twitter or fb to ask the Poke Genie staffers directly. I’m hoping that somebody here knows, and I both salute and thank @iLikeCastform for stepping forward to hazard an answer. Please, has anybody seen what I’m seeking who can point me towards it?